Luis Alberto De Paz was born in Mexico City and arrived at the young age of 11 to South San Francisco. The son of Mexican immigrants, Luis grew up looking after his two younger sisters while working and pursuing his goal of being the first in his family to earn a college degree. Luis grew up in a close-knit community which facilitated his passion for helping the community. As an undergraduate student, Luis was involved in many student organizations, including student government, where he served as Vice President of Finance. Luis enjoyed being involved, because it gave him the opportunity to advocate for his peers and make a difference. He was also part of the A.B. 540/Undocumented Task Force and has been active in advocating for the creation of a Student Resource Center for DREAMERS on campus. 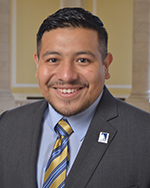 Luis hopes to learn more about the policy-making process during his time as a CHCI Public Policy Fellow. He also hopes to build a strong network and grow as a professional Latino in order to empower future generations and fight the injustices that many communities face in today’s world.